Caterpillar Local Host Plant: Pipturus argentus (Urticaceae, common name: Australian Mulberry). A Malayan Eggfly -f anomala perching on a vine in a wasteland. 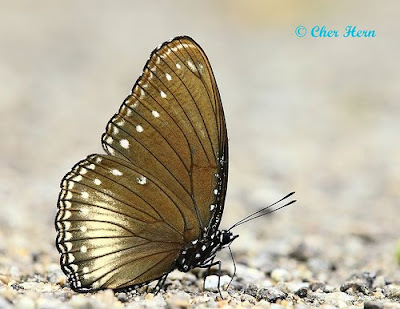 A puddling Malayan Eggfly -f nivas. 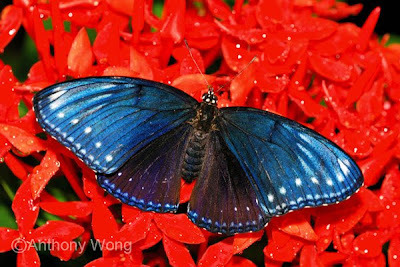 A Malayan Eggfly -f anomala featuring prominent blue gloss on the forewing upperside. 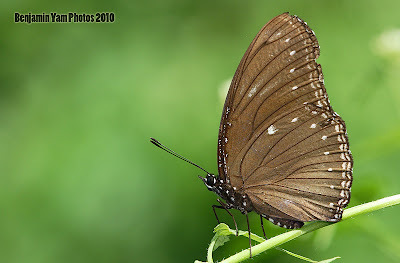 On both upper- and undersides, the wings are dark brown. 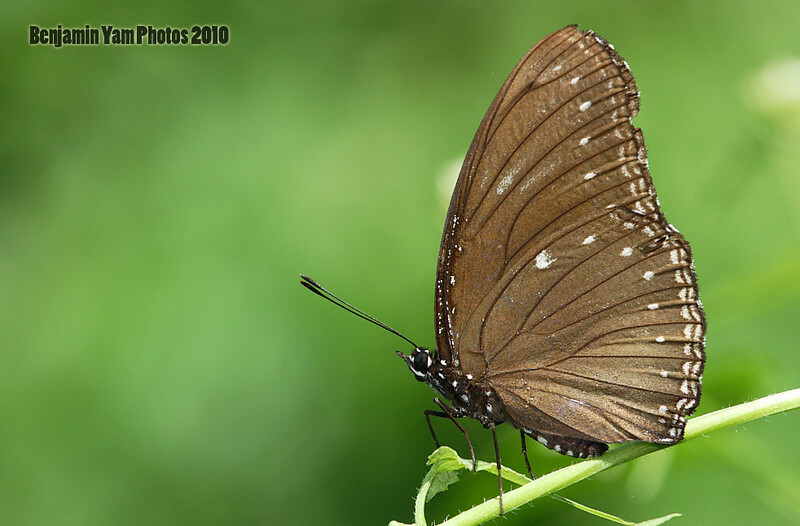 Both fore- and hindwings have a submarginal series of small white spots and a full post-discal series of white spots. Two forms (-f anomala and -f nivas) of the adults occur in Singapore. 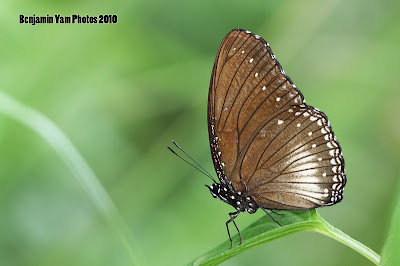 In form -f nivas, the hindwing has a diffuse white post-discal band which is absent in the more common form -f anomala. Some specimens also feature a brilliant blue-gloss on the forewing upperside (see the picture above). 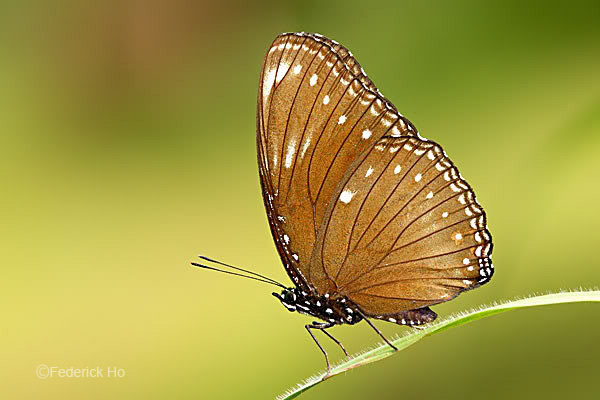 The Malayan Eggfly is considered a mimic of Euploea species, and is subject to varying degrees of variation among individuals. Upperside shots of puddling Malayan Eggfly adults. 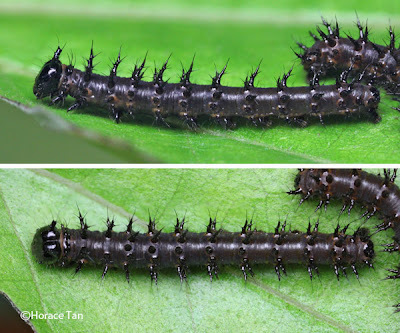 Left: -f anomala; Right: -f nivas. 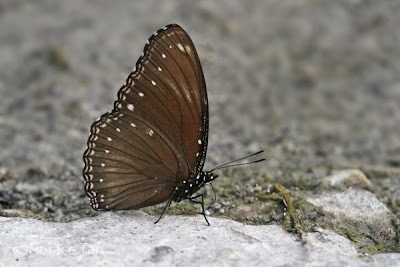 Malayan Eggfly. Left: -f anomala; Right: -f nivas. 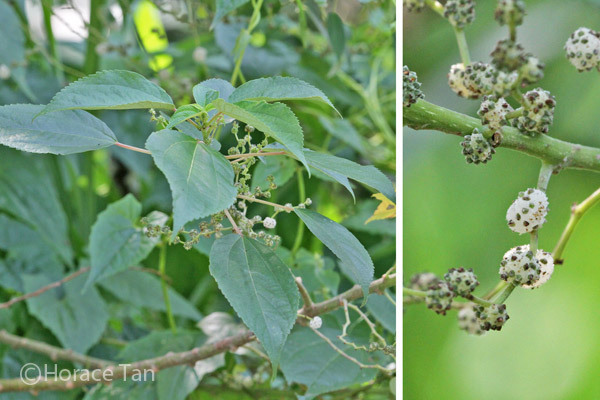 This species frequents lowland forests and is relatively common in Singapore, especially at locations where its host plant is growing, typically in wastelands, hill parks and fringe of nature reserves. Adults have been sighted visiting flowers and puddling in their habitats. Perching adults have the habit of defending its territory by engaging in dog fights with other intruding butterflies. 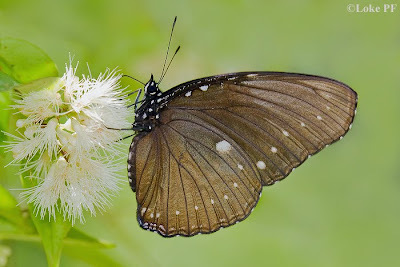 A Malayan Eggfly -f anomala visiting Syzygium flowers. 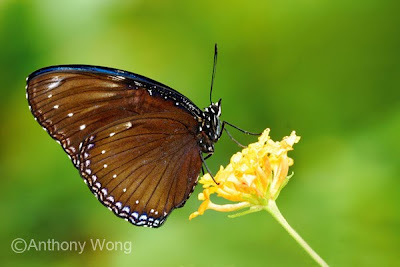 A Malayan Eggfly -f anomala visiting Ixora flowers. 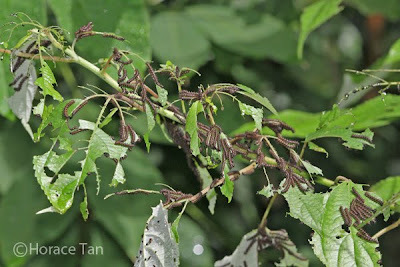 The caterpillars of the Malayan Eggfly feed on leaves of the sole local host plant, the Australian Mulberry. The caterpillars are gregarious (living in groups) in all stages, and they typically occur in such large numbers that they easily defoliate one whole plant before moving on to the next one in the vicinity. 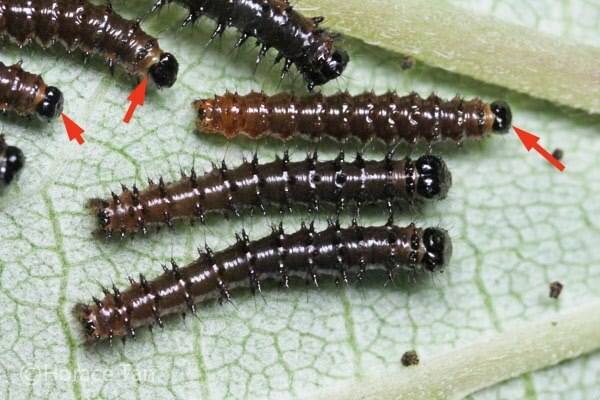 One noteworthy point is that the Malayan Eggfly caterpillars are observed to show no interest in eating their shed exuvia after each molt. It is common to observe a large collection of such exuvia in an infested tree in the wild. Local host plant: Pipturus argentus. A close-up on fruits is given in the right panel. 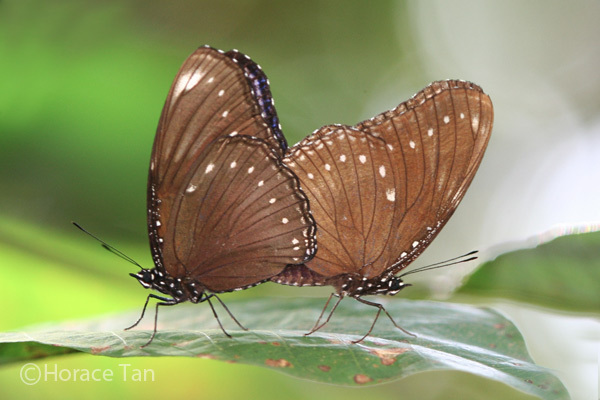 A mating pair of the Malayan Eggfly. 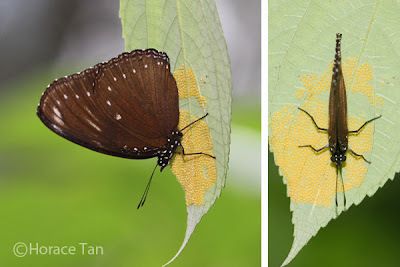 Two views of a mother Malayan Eggfly standing guard over its eggs. 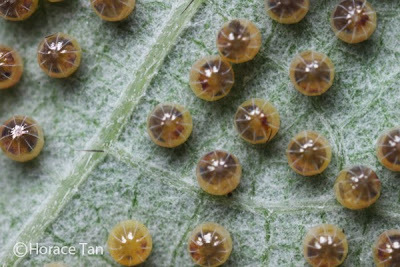 A view of the cluster of Malayan Eggfly eggs laid on the underside of a leaf. The eggs of the Malayan Eggfly are laid in a large cluster (up to several hundreds) on the underside of a leaf of the host plant by the mother butterfly. The mother has the habit of standing guard over its eggs, and could stay in the sentry position for a very long period of time. 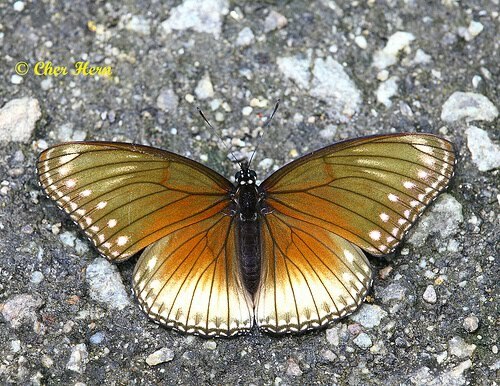 At times, worn and dead mother butterflies could be found in this on-guard posture close to either the developing eggs or early instars of its offspring. 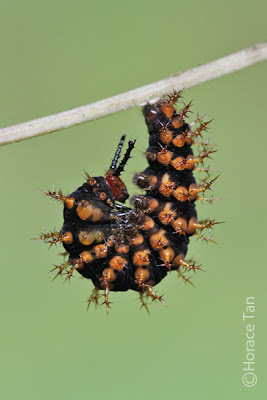 A worn and tattered mother Malayan Eggfly still keeping "an eye" on its offspring (likely 2nd instar) a week after it (in pristine condition) was found standing guard over its eggs (shown in an earlier picture) . 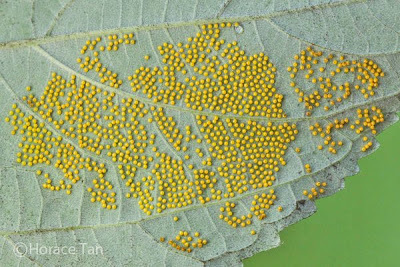 Each egg is golden in colour and somewhat globular in shape. Nine ridges run from the micropylar at the top to the base where the egg is adhered to the leaf surface. Numerous inconspicuous striations runs horizontally between these vertical ridges. 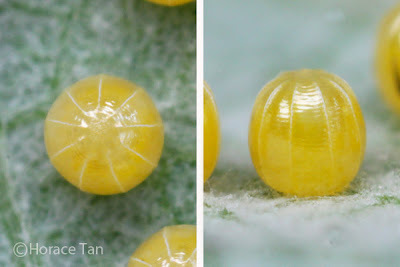 Each egg has a diameter of about 0.5-0.6mm, and a height of about 0.7mm. Two views of an egg of the Malayan Eggfly. 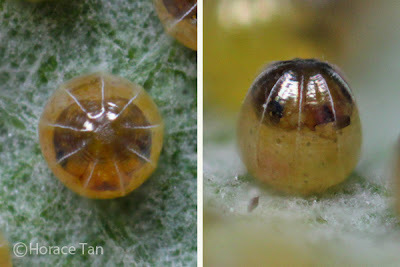 Two views of a mature egg of the Malayan Eggfly. The head capsule is now visible through the egg shell. 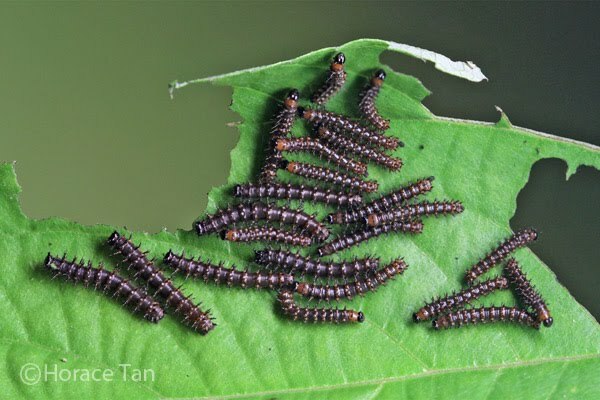 A group of mature eggs of the Malayan Eggfly. The egg takes about 3-4 days to hatch. The young caterpillar emerges by eating away part of the egg shell. Much of the egg shell becomes the first meal for the newly hatched which is 1.9mm in length. It has a cylindrical and yellowish golden body covered with many small and dark tubercles. Long, fine and dark-colored setae emanate from these tubercles. The head capsule is black, mostly round in shape with no visible horns. 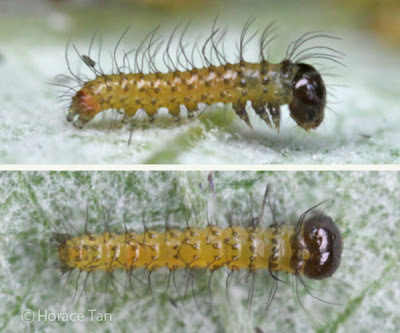 Two views of a newly hatched caterpillar of the Malayan Eggfly, length: 1.9mm. Two views of 1st instar caterpillar of the Malayan Eggfly, length: 3mm. 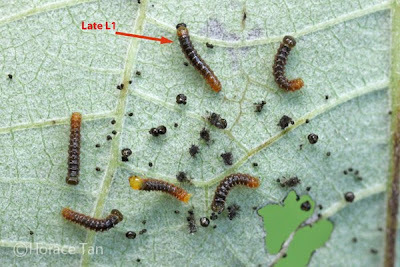 The 1st instar caterpillar feeds on the lamina of young leaves, and this diet gives the caterpillar body a strong undertone of dark green. After reaching about 3.5mm in 2.53.5days, the caterpillar moults to the 2nd instar. One late L1 among a group of freshly moulted L2 caterpillars. Note the shed L1 head capsules. The body of the 2nd instar caterpillar is yellowish brown in base color with a darkgreen undertone. The same layout of tubercles as seen in the earlier instar is still present, but now short and stubby processes raise from tubercles, and serveral short and fine setae branches from each of these processes. The head capsule is black with two tiny and short apical horns. This instar lasts about 2-3 days with the body length reaching about 6.5-7.5mm. 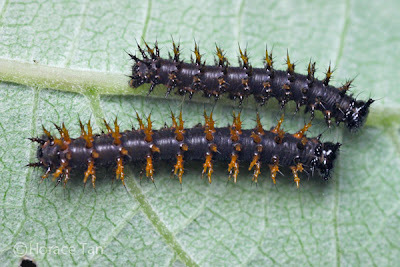 A group of 2nd instar caterpillars. A group of late 2nd instar (marked by red arrows) and early 3rd instar caterpillars. 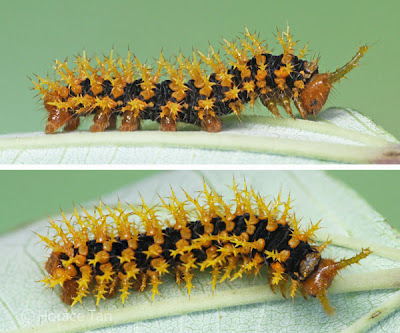 The 3rd instar caterpillar resembles the 2nd instar caterpillar closely. Two changes are discernible upon a close examination. The first is the increase in the length of the setae-bearing processes covering the body surface. The second is the increase in the length of the two cephalic horns. This instar takes about 2.5-3.5 days to complete with body length reaching about 10-11mm. Two views of a 3rd instar caterpillar, late in this stage, length: 10mm. A group of late 3rd instar and early 4th instar caterpillars. 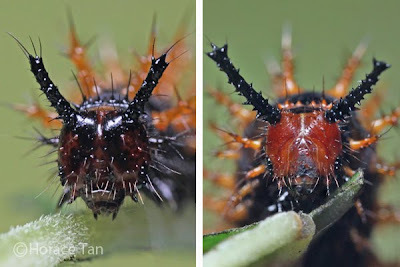 The 4th instar caterpillar closely resembles the 3rd instar caterpillar, but with visibly longer body processes and cephalic horns. 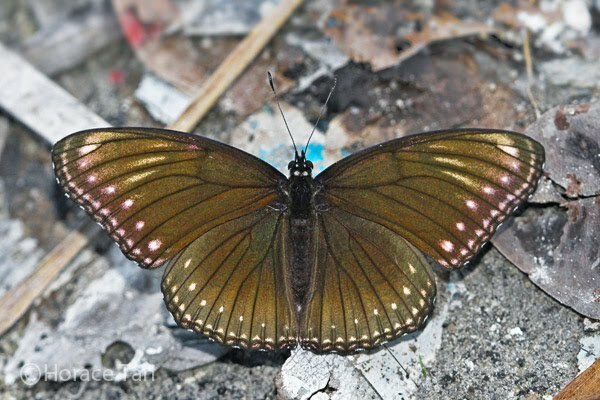 The body color is dark brown to black. 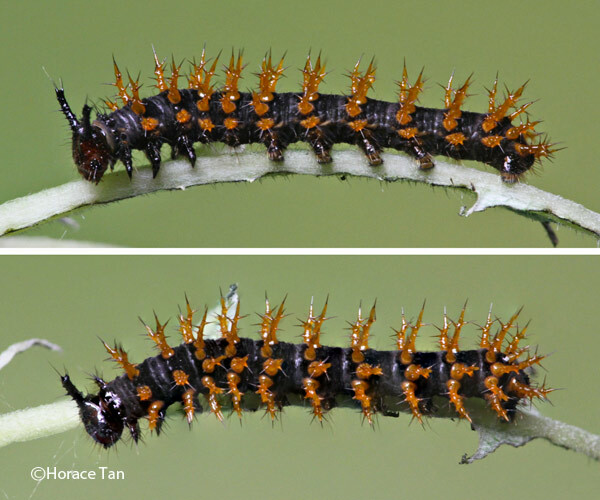 This instar lasts 2.5-3.5 days with the body length reaching about 14-15mm. 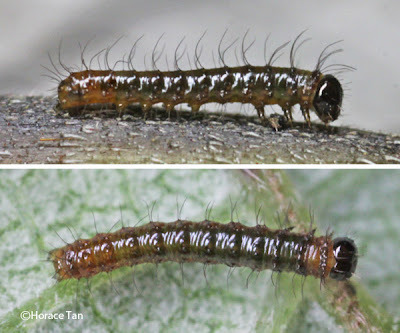 An early 4th instar caterpillar (top), length:10mm, and a late 4th instar caterpillar, length: 13.5mm. 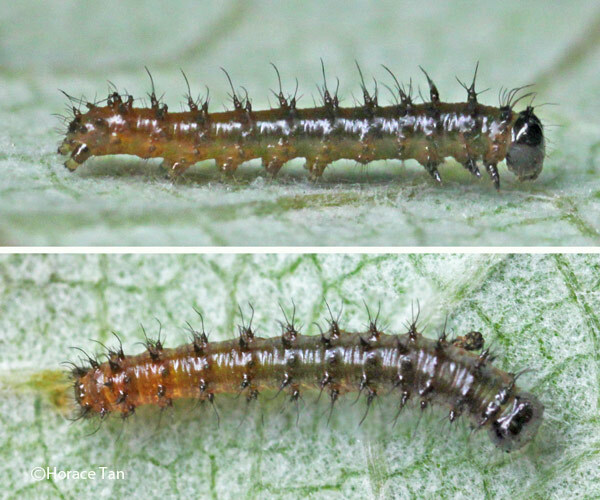 Two views of a 4th instar caterpillar, length: 12.5mm. 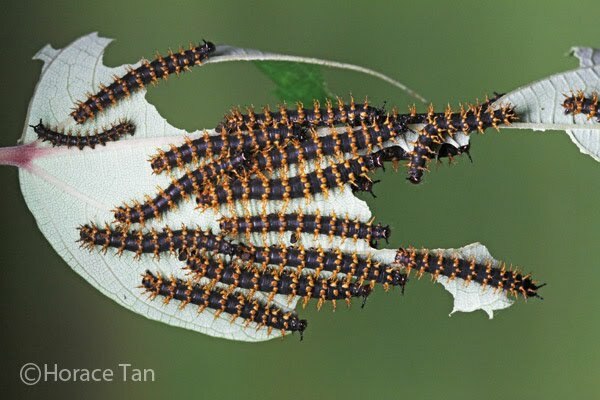 A group of mostly 4th instar caterpillars defoliating a plant in a wasteland. 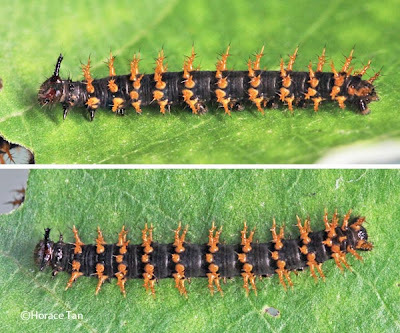 The 5th (and penultimate) instar caterpillar has much longer body processes which have become yellowish brown to golden in color. The pair of cephalic horn is now so long that it is roughly equal to the vertical length of the head capsule. The head is also changes from an entirely black coloration to one with intermingling patches of black and reddish brown. Two views of a 5th instar caterpillar, early in this stage, length: 17.5mm. 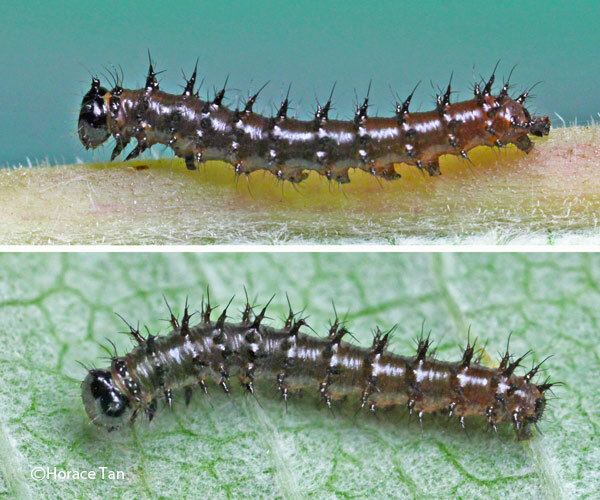 Head capsules of a 5th instar caterpillar (left) and a 6th instar caterpillar (right). 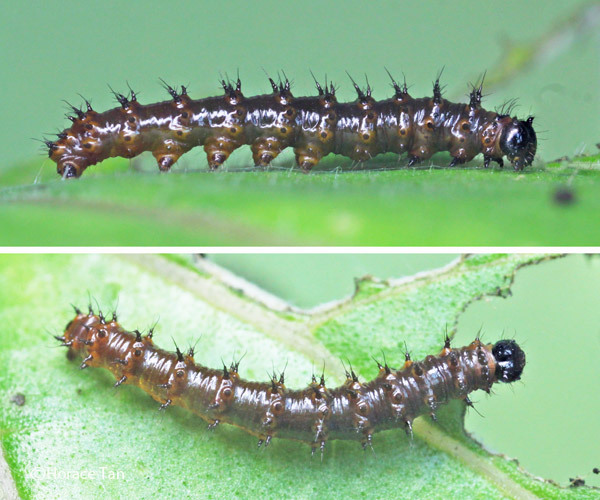 Two views of a 5th instar caterpillar, later in this stage, length: 22mm. The 5th instar lasts for 3-4 days and has its length reaches up to 32mm before the next moult. 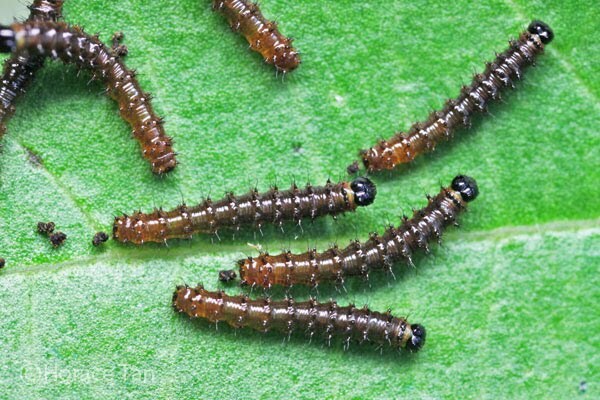 A group of 5th instar caterpillars. Two views of a 5th instar catepillar, late in this stage, length: 32mm.. 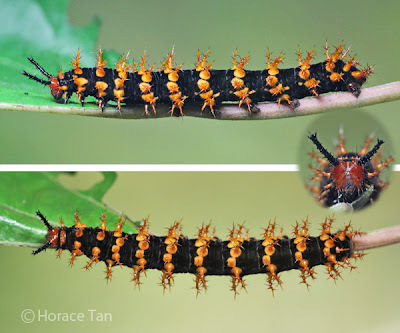 The 6th (and final) instar caterpillar has rather prominent golden dendrite processes and its cephalic horns is now nearly twice the vertical length of its head capsule. The head capsule has changed to reddisk brown in color, but cephalic horns remain entrely black. This final instar lasts for 4-5 days, and the body length reaches up to 50mm. 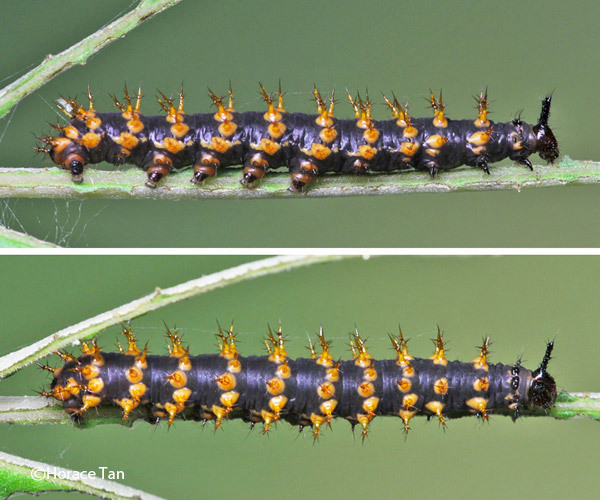 Two views of a freshly moulted 6th instar caterpillar, length: 30mm. A large group of final instar caterpillars found in the field. Two views of a 6th instar caterpillar, late in this stage, length: 50mm. On the last day, the caterpillar ceases feeding and wanders around in search of a pupation. 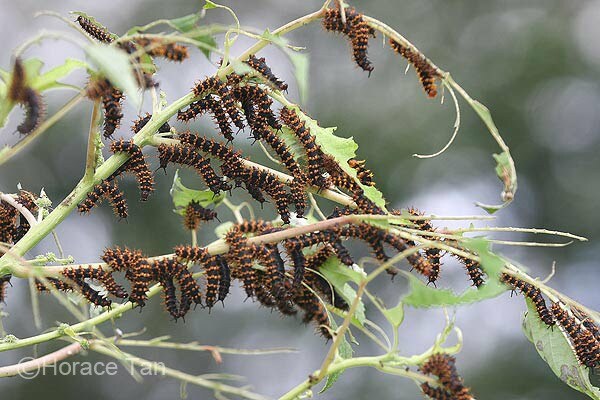 In the field, pupation sites have been found at a sizeable distance away from the infested host plant. The pupation site could be the underside of a leaf (not necessary that of the host plant) and stems/branches of a chosen plant. At this site, the caterpillar spins a silk pad from which it hangs vertically to take on the pre-pupatory pose. A pre-pupa of the Malayan Eggfly. 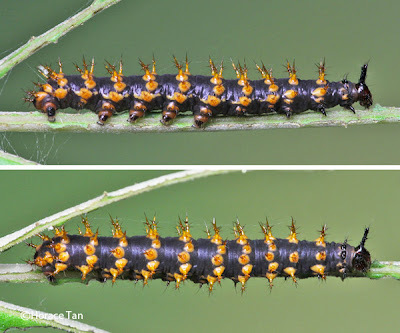 A pre-pupatory larva assuming its "hanging" posture, and the subsequent pupation event half-day later. Pupation takes place about 0.5 days later. The pupa suspends itself from the silk pad with no supporting silk girdle. It is entirely pale to golden brown. Dorso-laterally there are several rows of dark brown spiky processes. In the wing cases, the veins are marked in dark brown. 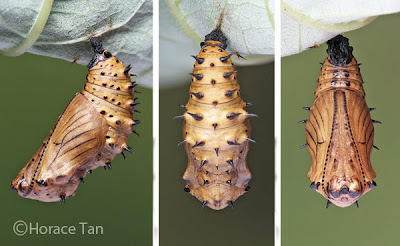 Length of pupae: 19-21mm. Three views of a pupa of the Malayan Eggfly. Three views of a mature pupa of the Malayan Eggfly. 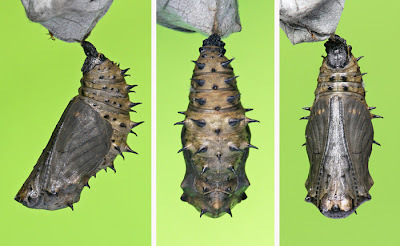 After about 6 days of development, the pupa turns dark as the pupal skin becomes translucent and the coloration and the markings on the forewing upperside become discernible as a result. The eclosion event takes place the next day. 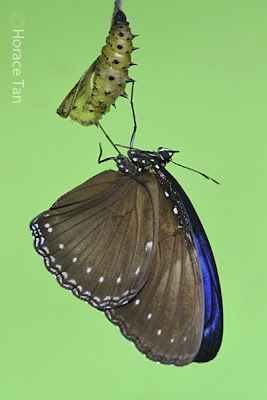 A Malayan Eggfly emerges from its pupal case. 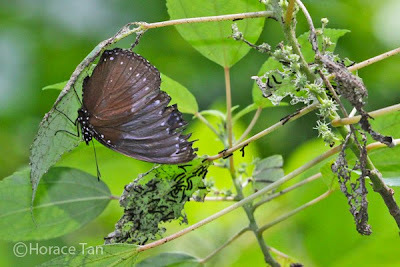 A newly eclosed Malayan Eggfly resting on its pupal case.